Which records changed your life? David Bowie’s Hunky Dory changed my life because I was 15 years old and loved all the weird noises and the way tracks melted into each other. I was also a big fan of Phil Spector at the time and loved his “Wall of Sound” which somehow, I think, came out later in a bastardised form on some of my recordings! What do you focus on the first time you hear a song? I always focus on the voice. Do you do any processing while tracking? I usually though try some compression on drum ambience and hope that the drummers feel will work with it. But I don’t really have any rules as to what I use. How do you approach your mixes? I try to build a mix as I am recording, and often say to the band not to expect anything radically different when the mix is finished. Having said that, my Peter Gabriel recording was completely sculpted in the mix. Basically, I am always mixing! You don't want to mix too hot, to get digital clipping, as everything is being mixed into the digital domain now. The loudness wars are more to do with mastering engineers. Do you have different approaches for different genres? Be true to the genre, except when you need to screw it up! What makes a great song for you? What makes a great album? A great song for me doesn’t reveal itself all at once. A great album, if anyone cares anymore, should obviously flow like a beautiful journey. Which Waves plugins do you use most? The Studio Classics Collection. 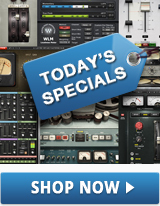 The SSL compressors are great on just about anything: drums, bass, and sometimes guitars. Even with the "real thing" available, I will replicate it with the Waves and keep the outboard to a minimum. I usually use SSL compressor on the mix bus and a small amount of EQ and the V-Series and API for bass and guitars. The plugins do most of the EQ and compression on all the tracks, with the console being used mainly for summing, panning, and a real EMT plate if available. I also use Renaissance Vox is mainly used as part of the vocal chain. I tend to use the L2 for stereo tracks, keys, piano, stereo FX, etc. What do you like most about the production process? I love a band to be as prepared as possible to make a recording, but I believe the main magic happens when I get into a studio with them! What’s the secret to creating a classic? A classic should be timeless, so the fewer novelty sounds the better. If you were to compare producing records to other art forms, which would they be? Do you have any unusual tips or tricks you can offer our readers about the way you use Waves? Any advice for aspiring producers? My advice to young producers is to make their artist feel as creative as possible.